Over 52,000 trainee graduates in government departments and institutions are preparing to agitate demanding their absorption into the permanent cadre. "They seek an urgent meeting with the Minister of Public Administration and Home Affairs, W.D.J. 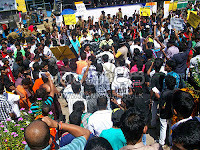 Seneviratne, to discuss their unresolved grievances," said Convenor, Centre for Graduates, Dhammika Munasinghe. He said the government is planning to absorb only those who have completed one year of service, before the end of this month. "That decision is not fair since we were promised to be absorbed into the permanent cadre after the completion of six months. The trainee graduates were not given any privileges that other government employees are entitled to. Only a Rs 10,000 monthly allowance is paid to the trainees," he charged.